The Ruby LA is dedicated to ensuring equality in opportunities and transparency in our administrative work. We do so through school assemblies, meetings, and giving students, performers, and writers the voice to change the theater’s inner-workings. Our curriculum aims to develop each person’s unique character. 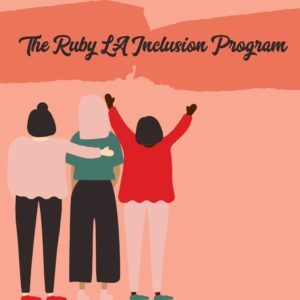 We offer eight scholarships to new and returning students each year, to study any class they’d like at The Ruby LA. The application period will reopen sometime in 2019. Exact date TBD. After submissions, a select few will be invited to a workshop, where they will meet our program committee as well as have the opportunity to improvise with them. Absolutely no performance or writing experience is needed, only a desire to learn comedy. Awards are given out to eight incredible applicants the following month. If you have any questions, feedback, concerns, comments, or recommendations, email us at advocate@therubyla.com.